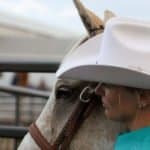 I baked a batch for my friends to enjoy one morning while we decided our arena was too muddy and slippery to risk running our horses. We were sad. Cookies totally make up for being cold and caked in mud though. After I shared these I had requests all around for my recipe. 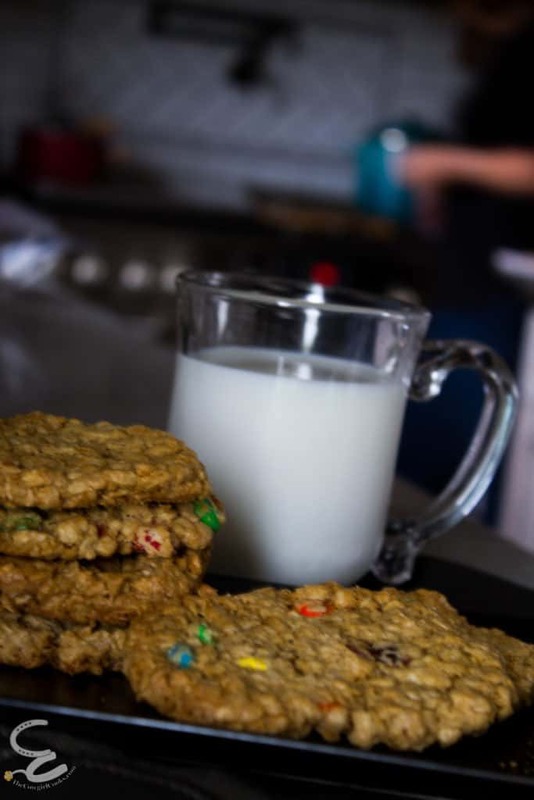 Monster Cookies are just what is needed on a cold and dreary day when you can’t go outside to play. Something about the phrase “Monster Cookie” always conjures up an image of the Cookie Monster from sesame street. Am I the only one who has ever thought that these are the cookies Cookie Monster should be eating? Anyone else? They are his namesake after all. 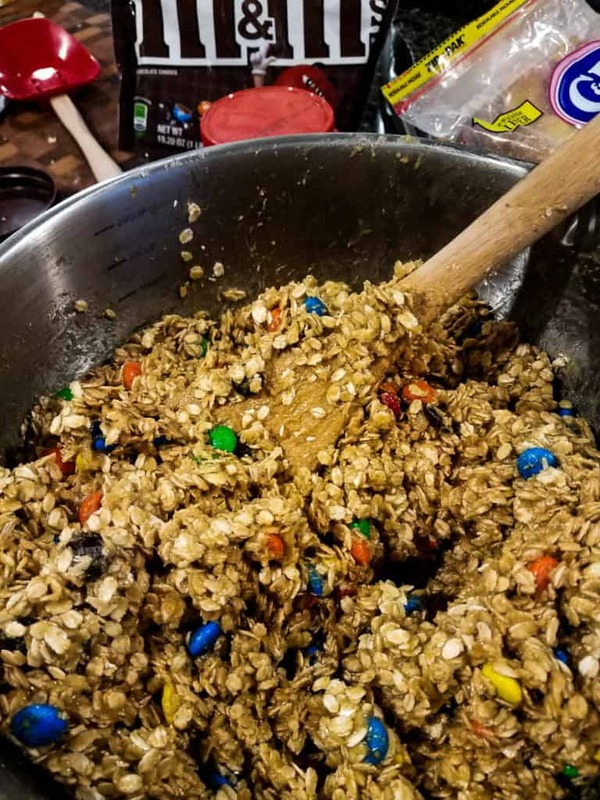 Even though I add extra sugar and candy to this recipe ( it is a cookie, not a health food) I don’t add butter. Why? Because I forgot to add it once and everyone raved about my monster cookies! Now it is part of my recipe. Maybe you could call them “healthier” – I don’t think anything with that much sugar can be considered healthy though . You may burn a few calories by stirring in all the oatmeal . Be prepared to stir in the oatmeal by hand. You will appreciate all the work your mixer can do. Be prepared to shuttle a number of cookies in and out of the oven – or use a giant sheet pan if you have one and it fits in your oven. The batch size and cook time are dependent on your definition of a large scoop. I use an ice cream scoop – if you have something else you like better, use it. Time to get your hands dirty and make some cookies. 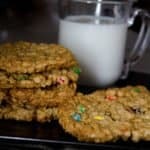 Monster cookies are an easy way to feed a crowd, Or even a great breakfast alternative if you are ok with cookies for breakfast. This recipe makes a very large batch of large cookies – but your cookies will depend on how big you make them. If you make smaller cookies, you may need to reduce the cook time. In a very large mixing bowl Cream together eggs and sugar and peanut butter. Add karo syrup and baking soda. Place on greased, or parchment lined baking sheet in large spoonfuls ( I use an ice cream scoop) then flaten slightly with damp fingers or spatula. Allow cookies to cook 30 seconds 1 minute on the baking sheet so they will easily come off the sheet. Transfer to cooling rack and enjoy!